Heights Restaurant, 5th floor, Apex International Hotel, 31-35 Grassmarket. +44 131 300 3456, (Hotel). +44 845 365 0002 (Restaurant Hotline). 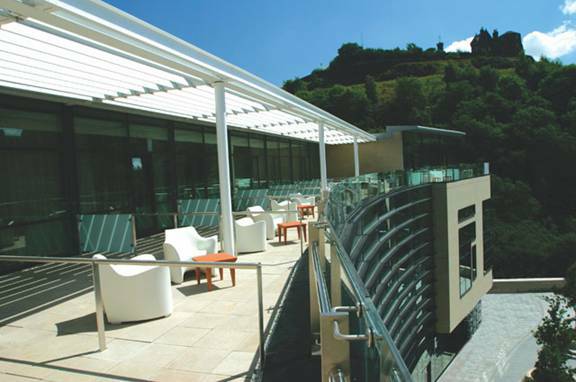 On the fifth level rooftop, with beautiful surroundings and great views of Edinburgh Castle from your table. The Forth Floor Restaurant, Brasserie and Bar, Harvey Nichols, 30-34 St. Andrew Square, Edinburgh EH2 2AD. +44 131 524 8350. On the top floor with marvellous views of the city. 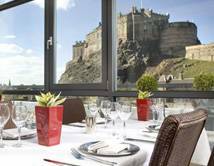 Floor-to-ceiling windows in the restaurant give great views over the Edinburgh skyline from the Castle to The Firth of Forth. Entrance from outside the Harvey Nic's store on Multrees Walk. 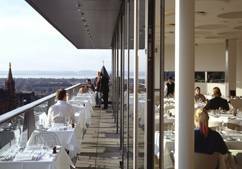 The Tower Restaurant, Museum of Scotland, Chambers St, Old Town, Edinburgh +44 131 225 3003. In the roof: is rather expensive but has one of the best views in Edinburgh. Rooftop restaurant looks across at the castle and law courts and surveys the city skyline. Above the landmark Museum of Scotland. The Glasshouse Hotel, 2 Greenside Place, Edinburgh, EH1 3AA. UK. +44 131 525 8200. +44 131 525 8200. Enjoy your meal al fresco on your balcony overlooking the city, or your terrace facing on to the 2-acre roof garden with views of Calton Hill.